New book, 400 pages. Once the stories have been told of battles won and lost, most of what happens in a war remains a mystery. So it has been with accounts of World War II in the Pacific, a conflict whose nature is only obscured by the linear narrative. In this book, a veteran and respected military author opens the story of the Pacific War to a broader and deeper view. Going beyond the usual accounting, William B. Hopkins investigates the strategies, politics, and personalities that shaped the conduct of the war. His regional approach to this complex war conducted on land, sea (and significantly by America, undersea), and air offers a more realistic perspective on how this multifaceted conflict unfolded-in many ways, and on many fronts. 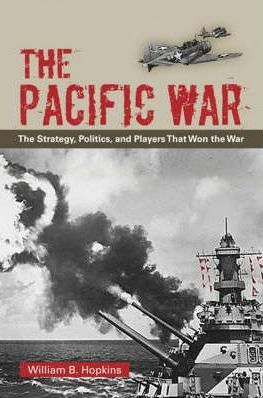 As expansive as the immense reaches of the Pacific, and as focused as the most intensive pinpoint attack on a strategic island, this account offers a whole new way of understanding the how's - and more significantly, the whys, of the Pacific War.